Last updated January 20th, 2019. Cambodia, a small nation of under 16 million people, probably is not the first place you would consider buying property in. In fact, thoughts of genocide and the Khmer Rouge might enter your mind when “Cambodia” is mentioned. That’s almost certainly the case if you aren’t so familiar with Cambodia or its recent history of growth. While this country in the very heart of Southeast Asia had its problems, over two decades have passed since the Khmer Rouge era. Cambodia is now open for business, is developing at a fast pace, and enjoys one of Asia’s best property markets. Today, we’ll look at several metrics such as rental yields, comparative analysis with other Asian markets, along with Cambodia’s wider economic fundamentals. Hopefully you’ll understand why we’re bullish on Cambodia real estate by the end of this post. A good property market demands a robust economy too. For its part, Cambodia’s economy is among the best in the whole region. Cambodia is growing at a rapid yet sustainable pace. Their GDP rose by 6.9% last year, ranked as the second fastest growing in Southeast Asia behind an otherwise noncompetitive Laos. Not only that, but Cambodia has a long history of high growth which hasn’t slowed down much in decades. They skipped the Asian Financial Crisis of the 1990s, missed the tech bubble during the early 2000s, and outgrew the 2008 Global Recession. Cambodia managed this while achieving GDP growth beyond 7% per year on average as well. Like other frontier markets, Cambodia has largely proven itself immune to global economic turmoil. Obviously, there isn’t such thing as a “recession-proof economy”. Every country has problems while each investment has its risks. With that said, Cambodia’s economy is about as close as one gets. Lack of reliance on markets such as the U.S. and European Union, in addition to solid demographics, works in Cambodia’s favor. There are few capital cities in the world where you can purchase prime property for low prices – especially in high-growth Asian frontier markets. Central real estate in Bangkok is worth over US$4,000 per square meter on average. “Buying” a leasehold apartment in less-developed Hanoi, Vietnam will even cost you more than US$3,000 per square meter. However, Phnom Penh stands out as the only Asian capital (besides Tbilisi, Georgia) where you can buy real estate in the middle of the city for below US$1,000 per square meter. We aren’t talking about Cambodia’s newly-built condominiums which have started popping up over the past few years though. These buildings are a testament to the country’s development, but are way too expensive with prices approaching Bangkok’s levels. Instead, look toward Phnom Penh’s older shophouse flats. These colonial apartments may not have a pool or a gym, but they’re also about 1/4th the price of a new condo unit, were built by the French, and are generally in good shape overall. 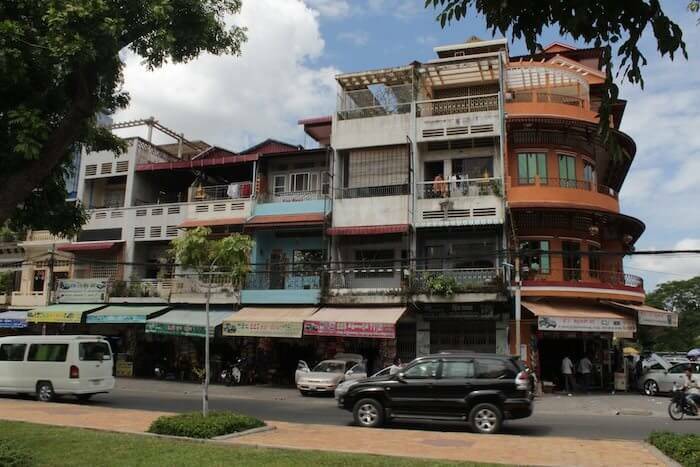 Shophouse apartments in Cambodia have attractive valuations – even if some renovation work is often needed. A few property markets in Southeast Asia have great capital appreciation prospects, yet suffer from horrible rental yields. For example, real estate in Singapore is fairly valued compared to its peers. Prices are around half of those in competing financial hub Hong Kong’s. But rental yields are abysmal, hovering around the 2% range. Similarly, Kuala Lumpur’s property market is among Asia’s least expensive. That’s despite being the capital of Malaysia, one of the region’s more developed markets. Rental yields barely break 3% on average there. Phnom Penh is fortunate enough to have both strong rental yields and appreciation prospects. The type of shophouse apartments mentioned above, on top of attractive valuations, also have yields exceeding 7% on average. The current situation won’t last forever though. Chinese and other foreign investors, previously in a “wait and see” mode leading up to the 2018 elections, are seeking to double down on their Cambodian assets later in 2019. Greater foreign investment may not immediately lead to higher prices, but the overall trend is clear. Cambodia’s economy and population are rising quickly, all while tourists and businesses alike catch word of Cambodia’s potential.